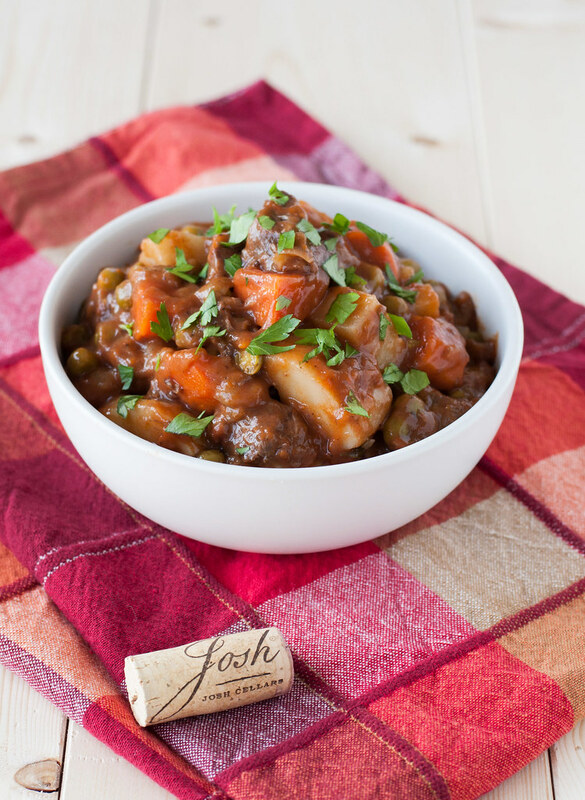 A.k.a., a highly improved version of canned Dinty Moore beef stew. 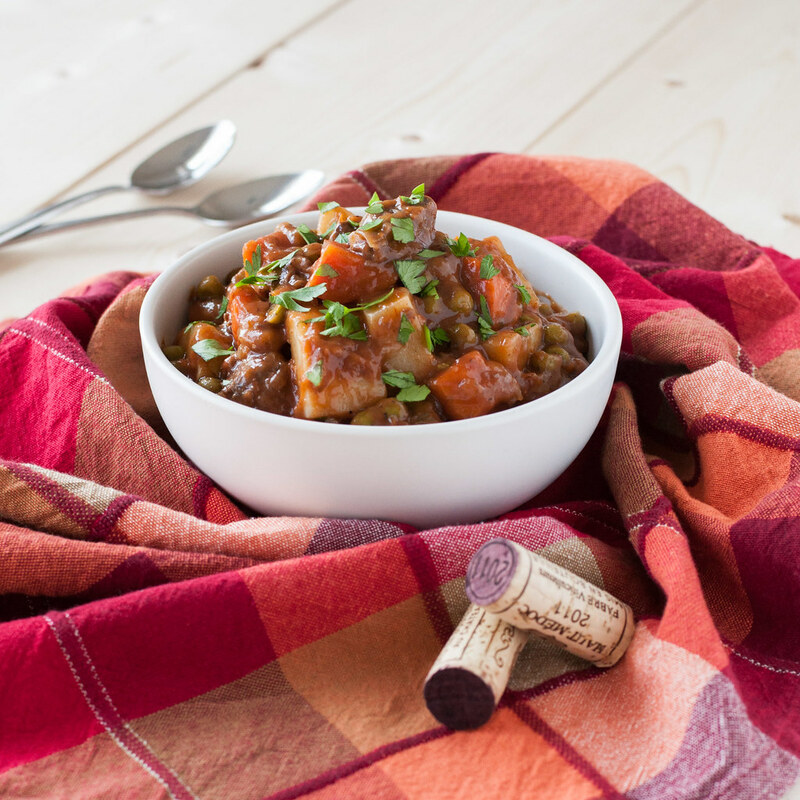 Believe it or not, that nostalgic can was the inspiration behind this thick stew with deep notes of red wine and a touch of bright tomato, which happen to create the perfect flavor balance for a hearty meal on a crisp fall day or night. 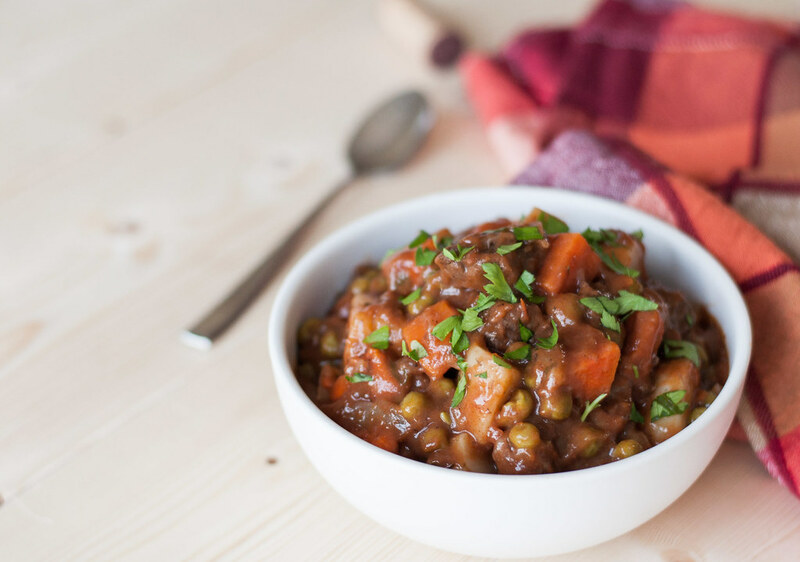 I remember many a beef stew night growing up in the sometimes arctic tundra of Minnesota, but there’s probably a good reason my mom stuck with the can instead of this recipe–perhaps maybe not feeding the kids a half bottle of red wine in their dinner is a good idea? Okay, the alcohol actually cooks off as it completely breaks down the meat into its most tender, juicy form imaginable, so there is no age limit or carding required when you serve this. In all seriousness, though, meals like this bring back the warm, cuddly feelings that go with fall family dinners, whether quickly warmed on the stove or crafted over an entire day. 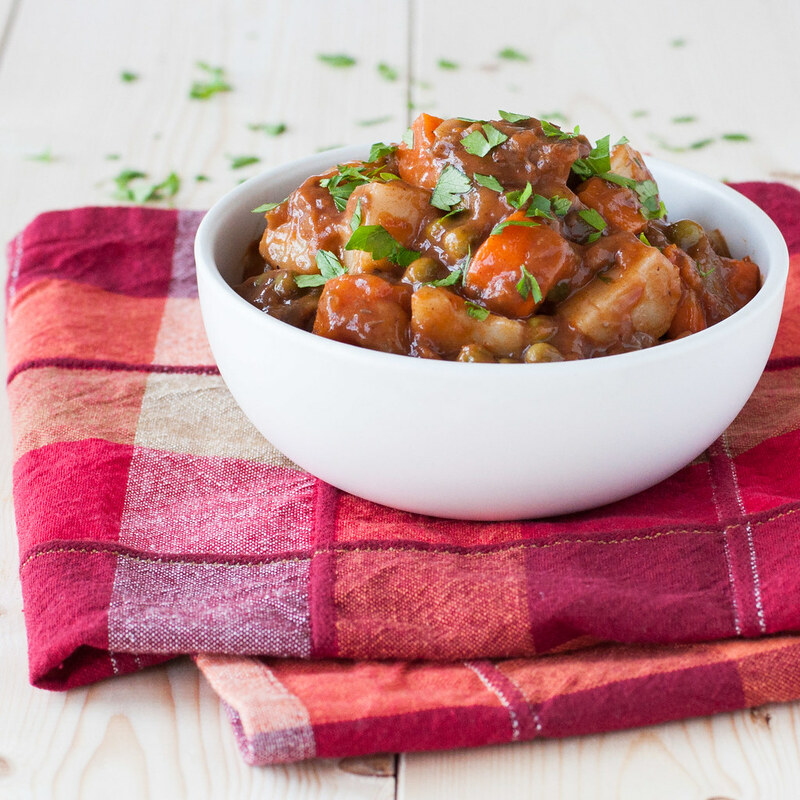 A lot of stew recipes I screened were served over a grain–rice, mashed potatoes, maybe some luscious cheesy grits, but I didn’t want to add another dirty pot and step to dinner. 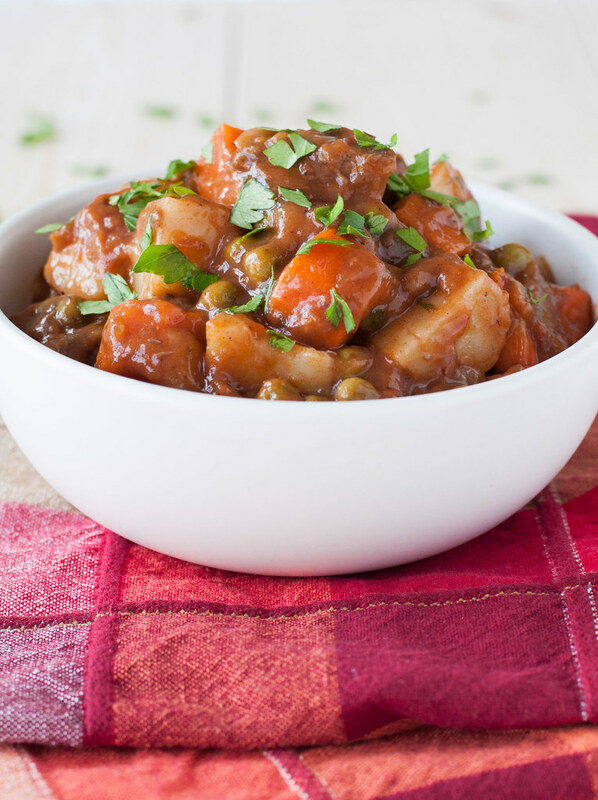 I wanted a balanced stew with a little bit of everything–feel-good starch already in there (potato), a little residual sweetness (from the wine and caramelized vegetables), a bit of freshness (real juicy tomatoes, instead of paste), healthy and colorful veggies, and, most of all, a certain deep flavor complexity. Really, the beef is kind of a side show, so check out the vegetarian mushroom version below if you’re so inclined. Sometimes you can’t beat the real thing, so you’ll find just a weeeeeeeee bit of flour in here to thicken it up. I did have an idea, after the fact, for a gluten-free thickener you could try. On Saturday morning Food Network, I once saw mashed potatoes used to thicken the sauce part of some delicious combination of biscuits and gravy plus eggs benedict. I haven’t tried this version, but I think I’ll play with it next time. If you’re feeling adventurous, I would add some mashed potatoes (starting with a half cup) after letting the tomatoes and wine cook off a bit–I’m not sure if the acid in either would cause any dairy content of mashed potatoes to curdle, hence the wait. I’d also make sure to stir frequently, since the starch in the potatoes will likely have the same issue as the flour, sticking to the bottom of the pan if allowed to cook unattended. The stew was delicious as is, but I’m going to go ahead and offer another variation besides gluten-free. You may want to make this vegetarian. I may want to make it vegetarian, because my taste buds loved it, but apparently my stomach doesn’t do so well with meat anymore. If you have the same problem, check out the mushroom version that I’ve summarized below and will be testing soon! Just as the red wine and tomatoes work to tenderize and flavor the beef, they’ll have the same impact on mushrooms and vice versa, because the mushrooms will release their earthy, comforting flavors into the stew as they cook. Drool. About the wine. Maybe you prefer not to drink it or cook with it. Totally fine. My recommendation would be to add a bit of tomato paste (in addition to the puree) after stirring in the flour, and also add a tablespoon (to start) of dark brown sugar when you add the stock and tomatoes. Then, simply replace the liquid of the wine with additional stock. If you are using wine but aren’t sure what to get, I adore the Josh Cellars Pinot Noir or Cabernet Sauvignon. 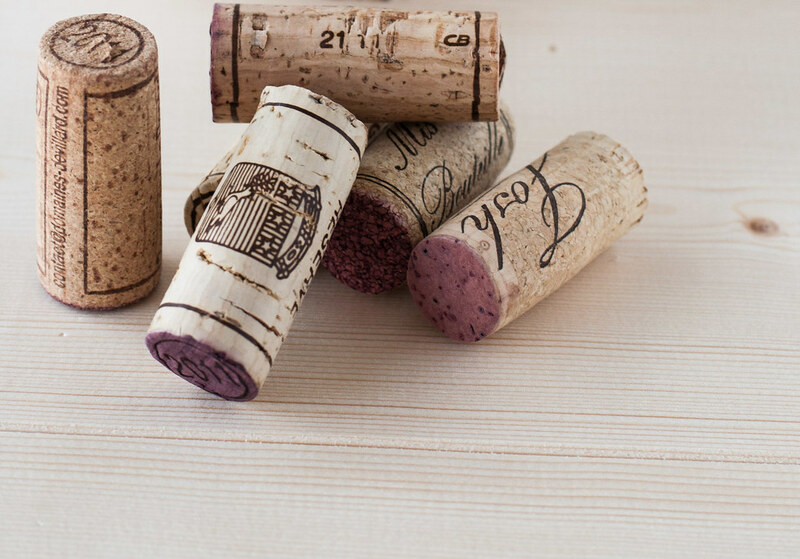 They’re easy to find, inexpensive, and great to drink since you’ll be “stuck” with an open bottle (please note: no finishing the bottle if you’re under 21!). You might be best off saving the prep for a lazy fall weekend, because the cooking time is pretty active (and a little long) due to the sticking issue I mentioned. It’s an excellent freezer meal, though, so freeze it right off the bat or save half for an emergency busy night. Speaking of busy nights (oh hey, clever transition), I just got back from a surprise getaway with my IT guy, and it was up there as one of the best surprise trips ever. Ummmm, only surprise trip ever? Either way, it was beyond relaxing. After a two hour drive, we arrived at the East Hampton Art House and settled in as the only tenants for the next two days! The house and grounds were perfect on their own, but the extra touch of the owners’ artwork as the main decor added so much character and charm. Honestly, I never would have pictured myself liking a place like this (I usually go for really clean and simple design), but it won me over without much effort. 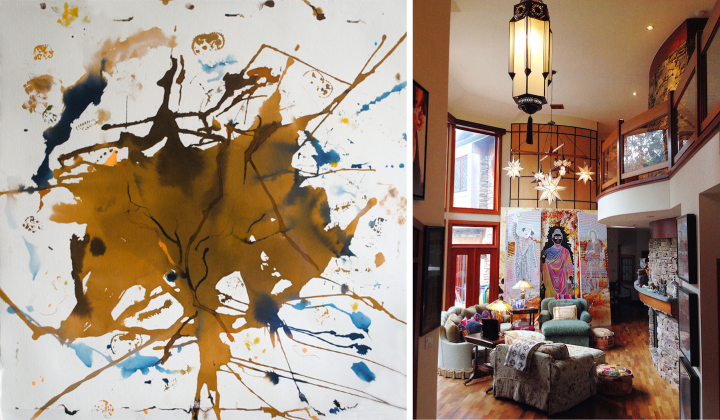 My favorite were Rosalind’s watercolor pieces all over the place. I’m not really a studio art person (as in, I don’t know much about the process of creating it), but both the owners’ home studios were also on premises and were fascinating to explore a little. A little more about how we kept busy in a future post! Including the pulled duck wrap I ate yesterday. *Adapted from Dave Lieberman’s stew recipe. 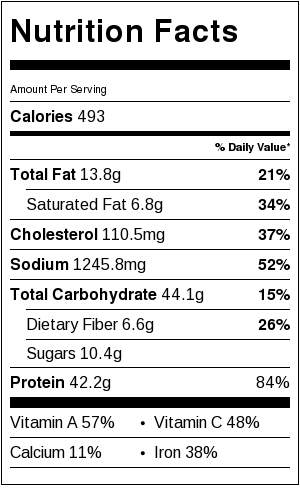 Nutrition facts don’t include sour cream served alongside. As of original post date, adaptations are untested. Begin the recipe by cooking the carrots and onions in oil over medium high heat, skipping browning the meat. Proceed as above, adding the flour, then the liquids and rosemary, and bringing to a boil. Add mushrooms after reducing to a simmer, then proceed as directed, cooking for about 45 minutes each both before and after adding the potatoes. I made this on a brisk fall Saturday while my boyfriend was at work. When he walked through the door he immediately commented on how amazing the stew smelled. (I think he was pleasantly surprised)! I contemplated adding celery but decided to strictly follow the recipe and I am so glad I did because the “gravy” was a perfect consistency. 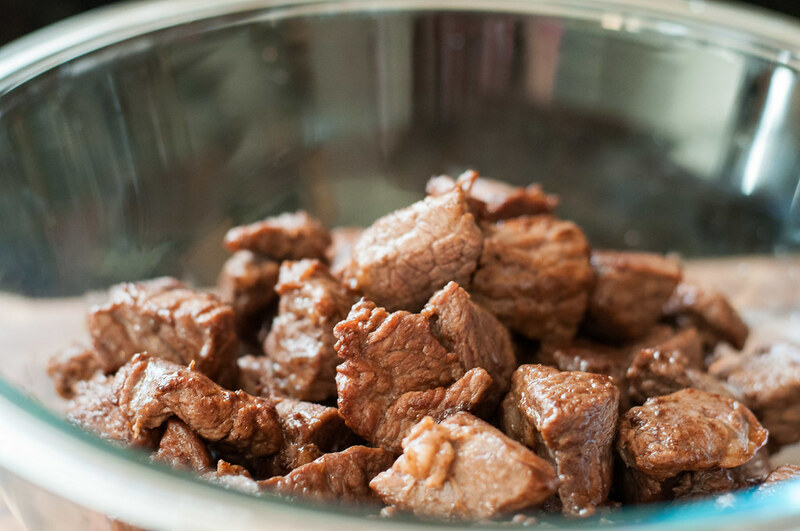 The red wine really adds complexity and tenderizes the beef without having to add additional salt. All weekend we argued who was going to eat the leftovers because the stew was delicious. I am not much of a chef but the way Tessa explains each step really helped to make it seem like I knew what I was doing in the kitchen. Another reason why I tackled this dish was because there weren’t too many ingredients. Thanks again! 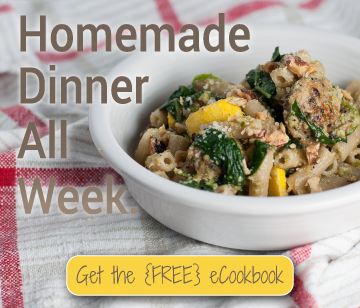 I look forward to trying more of your recipes! So happy you guys liked it :) That’s a big part of my goal with this blog, no matter how simple or complex a recipe, to show everyone that they can cook. I always try to follow recipes to a T the first time, but then you officially have permission to experiment next time! I need something like that to warm us up out here. Not sure where you’re located, but we are having some very chilly days here in CT still. It’s the perfect stew for that! I made the stew for my husband he couldn’t stop going on and on about good the stew was. I changed a few things like instead of stew meat I used London broil, added more carrots and potatoes . This is totally going in the recipe card box. I’m looking for make-ahead meals I can put in my slow-cooler / crock pot. How would you recommend I adapt this recipe. It’s sounds delicious! Sam, I honestly don’t do a lot of crock pot cooking, so I don’t want to steer you wrong with adaptations. I’m guessing Pinterest or Google will come up with lots of slow cooker beef stew recipes, though! If you can find time to make and freeze a big double batch of this recipe, it would reheat well in the crock pot on low, but because there’s flour in it I wouldn’t recommend starting it in the crock pot. Good luck! Can you freeze this? If so, do you make as normal then put in a freezer-safe container?